Hello, it is about time for another screen shot. What you can see is that the menus now work. I've decided to stick to one size fits all so that they cover the same space no matter how large the screen is. That is at the lowest resolution 640/480 and currently lets some strings overlap but that is a minor issue for later. 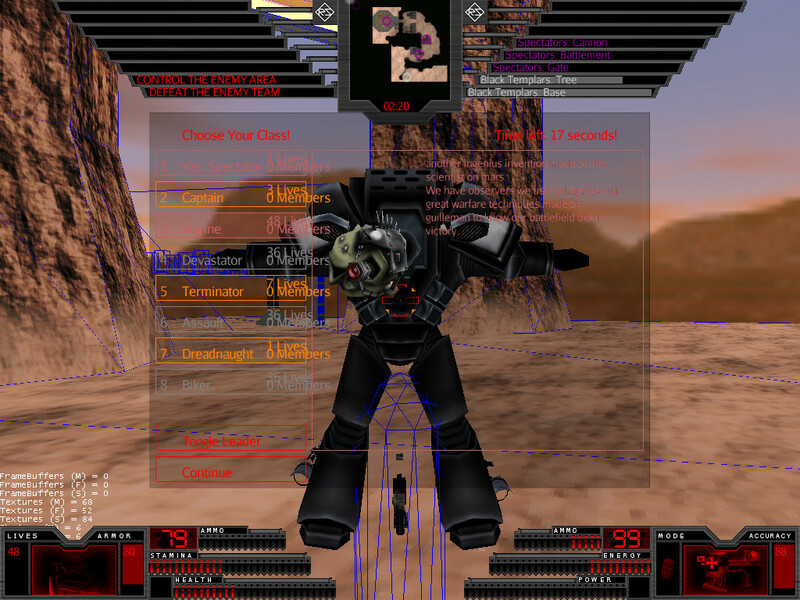 Additionally you can see that the player and weapon model is displayed and the hud contains the corresponding information. That is also true for the control areas. So as of now it is possible to actually fullfill a winning condition for the gameplay and thus go through several rounds of basic game play. There is still a lot of stuff missing as stated in earlier news. But I think my next focus will be to be able to connect to the game with a second client. For reasons of the Open GL rendering engine that means I'll have to connect headless, just by console, but I hope it'll be easy to implement a simple console client that allows basic menu interaction and spatial navigation.